Tradition has been on my mind lately. My husband and I hosted our families for Thanksgiving and Christmas this year. It was the first time for both of our families that we did not go “home” for the holidays and we spent a lot of time thinking about what family traditions we wanted to honor in our celebration and what new traditions we wanted to add to the mix. For Thanksgiving, we made sure that we had plenty of my mother-in-law’s famous spinach dip and that we kicked off the big meal with plenty of champagne and smoked salmon. My in-laws like to serve both russet and sweet potatoes on the Thanksgiving table and we gave these dishes a twist by preparing recipes that are favorites in my family. We tried out what we hope are new traditions with an oyster roast the night before Thanksgiving and a large barbecue with extended family the day after. We ate a lot. For Christmas, the same was true. We prepared my family’s traditional Christmas Eve dinner and made sure we started the evening with baked brie although I added my touch to my family’s classic meal with a steaming bowl of beef consommé to start and delicious chilled chocolate-espresso pots de crème to end. My mother kept everyone happy with her Christmas cookies and her delicious homemade Moravian sugarcake. For the second year in a row, my husband made his version of his mother’s gumbo for Christmas; it’s quickly become one of my favorite Christmas traditions. My brothers even got into the act of starting a new tradition when they set-off Christmas Eve to find a Yule log to burn that evening. The log-cutting equipment was pitiful, the resulting Yule log was surprisingly massive, and the story of how they got it shouldn’t be repeated. 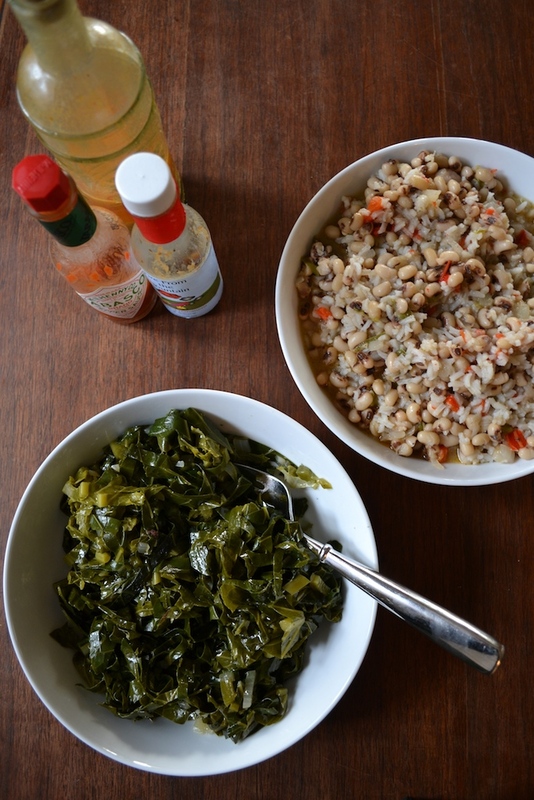 Today, in preparation for the start of 2014, I’m slowly simmering collard greens and making a big batch of hoppin’ john. 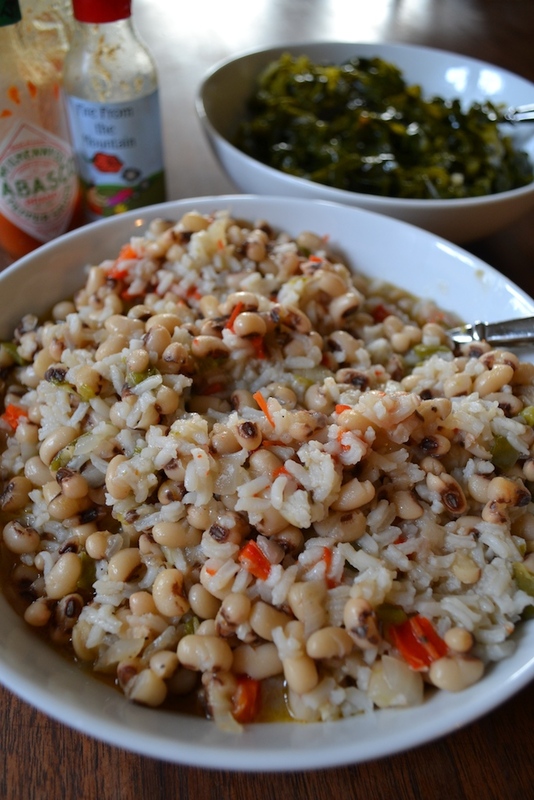 It’s a southern New Year’s tradition that eating collard greens will bring greenbacks in the coming year while a healthy serving of black eyed peas means lots of change in your pockets. My father brought this southern tradition from his family when he married my mother. 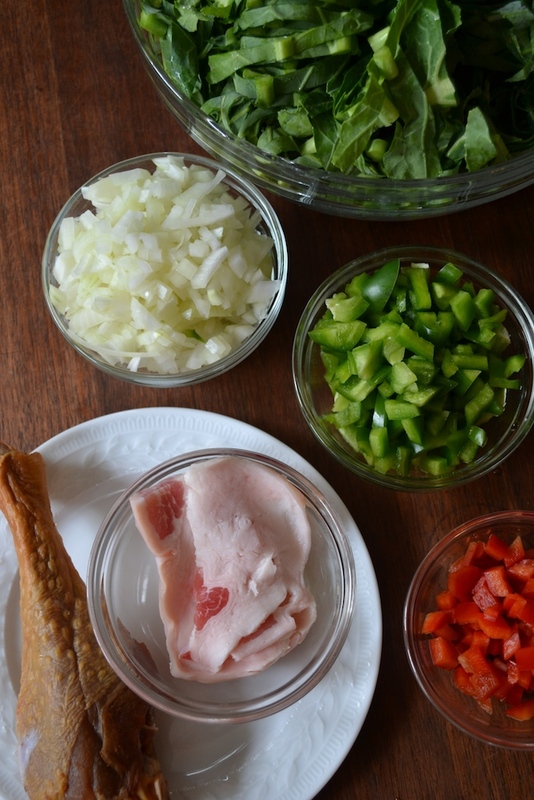 Barbara, who has worked with my family for as long as I can remember and long ago became a member of it, put her touch on this southern tradition by sharing her recipe for collard greens with us. Her collards are famous in the Florida panhandle and when she agreed to teach me how to make them, I didn’t waste any time in rolling up my sleeves and getting to work. The recipe itself is simple, but Barbara cooks with a lot of love and you can taste it in her food. While I don’t think my collard greens ever taste as good as Barbara’s, I always think about her when I prepare these winter greens and I like to think that reflecting on her provides the final seasoning. And so it goes with tradition. It’s just a dish or an isolated event until it’s done for you by someone you love. Then it becomes cherished, part of your story, and, if you are lucky, a new tradition. Wishing you a happy and tradition-filled 2014! Perhaps the best ever, but certainly the best in the Florida panhandle, Barbara’s collard greens are legendary! A must for dinner on New Year’s Day it’s hard to resist having them at other times of the year. Serve with your favorite hot sauce or vinegar. In a large heavy saucepan, add enough vegetable oil to cover the bottom of the pot. Heat oil over high heat until hot then add the onion, bell pepper, and chopped collard greens. Stir briefly then add enough water to cover the ingredients. Add the turkey wing and bring to a boil. Reduce heat to low and add two more cups of water to the pot. Simmer until collard greens are tender adding water as needed. 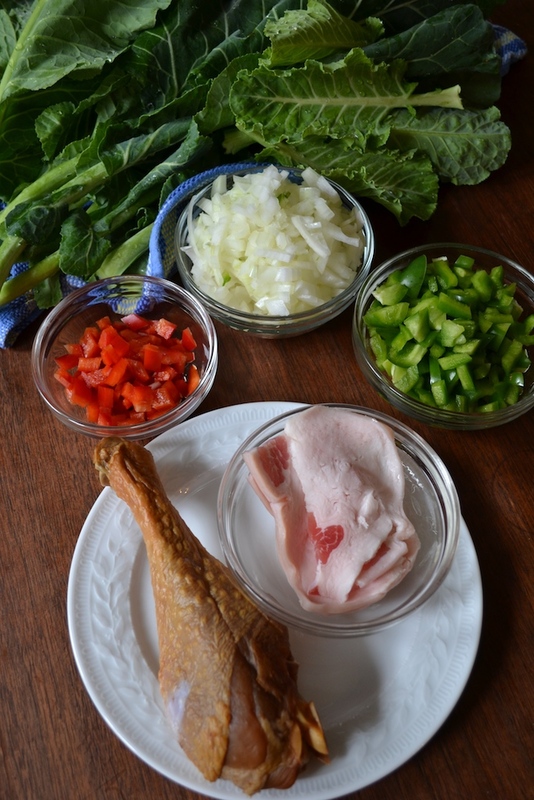 Discard the smoked turkey wing or shred it and add the meat to the collards. Season to taste and serve immediately. Collard greens, especially those you find at a local farmer’s market, can be very dirty. The best way to clean collard greens is to fill two sinks up with water. Put the collard greens in one sink and dunk thoroughly. Remove the collard greens from that sink and move them to the water in the next sink. You should see the leftover grit in the first sink. Rinse out the first sink and re-fill with water. Repeat process until sink is clean. Allow collard greens to dry. While some people like to remove the tough inner stalk, it’s not necessary. Simply place 4 or 5 collard green leaves on top of one another and roll into a tight roll. Using a knife cut across the roll to make ¼” to ½” strips. I typically cut the entire leaf and then discard the remaining stem although it can be finally chopped and added to the dish. Add the dried peas to a medium saucepan and cover with 2 inches of water. Bring to a boil and let boil for 2 minutes. Cover the saucepan and remove it from the heat. Let sit, covered, for one hour. Drain the black-eyed peas and set aside. Melt the butter in a large saucepan or Dutch oven over medium heat. Add the chopped bell peppers and onions and cook, stirring occasionally, for 5 minutes or until just beginning to soften. Stir in the salt pork, bay leaf, and drained black-eyed peas. Add 3 cups of water to the saucepan. If the water does not cover the ingredients, add a little more until all of the ingredients are covered. Bring to a simmer. Cover the saucepan and simmer gently for 45 minutes to 1 hour until the peas are tender. Stir in the long grain white rice and 1/2 cup of water. Add the salt, freshly ground black pepper, and cayenne. Bring to a boil. Cover the pot and reduce the heat to a simmer. Let simmer for 20 minutes or until the rice is cooked through. Remove the salt pork and discard. Add more salt and pepper, if needed. Serve with your favorite hot sauce.